Vitamin C is an important antioxidant and supports healthy capillaries. It is useful for winter ills and chills and supports healthy immune function. Vitamin C supports skin suppleness and elasticity via its role in collagen production and supports healthy healing of wounds. Vitamin C is beneficial during times of stress and promotes healthy gums. Adults: Take 2-3 capsules once or twice daily (or more if required), ideally around mealtimes. Lifestream Natural Vitamin C capsules contain acerola extract and the only filler used is certified organic tapioca starch. Most Vitamin C supplements available today are artificially produced from corn glucose, via chemical and/or fermentation processes. 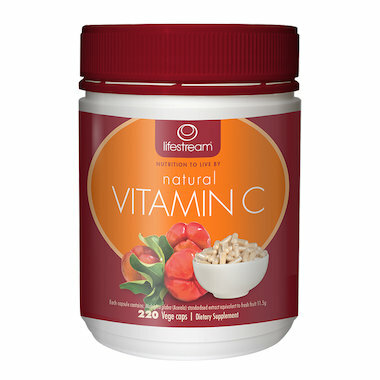 Lifestream Natural Vitamin C does not contain any synthetic ascorbic acid or anything artificial. Just a pure, naturally vitamin C-rich extract made from certified organic acerola berries.